LCD, AD, SPI, Uart, USB, SD/MMC Card, IIS, I2C, RTC, PWM, GPIO, Local bus and most I/O CPU lines can be extended via two 2.0mm space 56-pin biserial dip connectors. 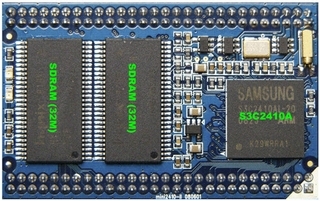 Embest Mini2410-II processor card is an embedded controller board based on Samsung's S3C2410A ARM920T processor. It has a super tiny design measuring only 58mm by 36mm. The memory system of the board is mainly including 64M SDRAM and 64M Nand Flash. 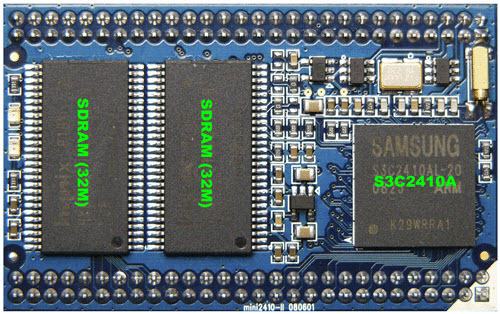 The processor card extends the basic features of S3C2410. Other peripherals like LCD, AD, SPI, Uart, USB, SD/MMC Card, IIS, I2C, RTC, PWM, GPIO, Local bus and most I/O CPU lines can be extended via two 2.0mm space 56-pin biserial dip connectors. A developer's kits with Embest Mini2410-II processor card are able to run on Linux and WindowsCE OS. The tiny board would be an ideal single board computer to be the heart of your embedded design. Embest has also designed an expansion board to enhance the functionality of the Mini2410-II. Please refer to SBC2410-III single board computer which using the Mini2440-I as CPU board and capable of supporting both Linux and WinCE OS. IO Interface LCD, AD, SPI, Uart, USB, SD/MMC Card, IIS, I2C, RTC, PWM, GPIO, Local bus and most I/O CPU lines can be extended via two 2.0mm space 56-pin biserial dip connectors.